This post contains a sample for programmatically populated af:inputComboboxListOfValues component, without using ADF model. In fact the core pieces used in this example are copied from ADF Faces demo source. This sample is useful if you use ADF Faces without ADF model(binding layer) and still want to implement ComboboxLOV. 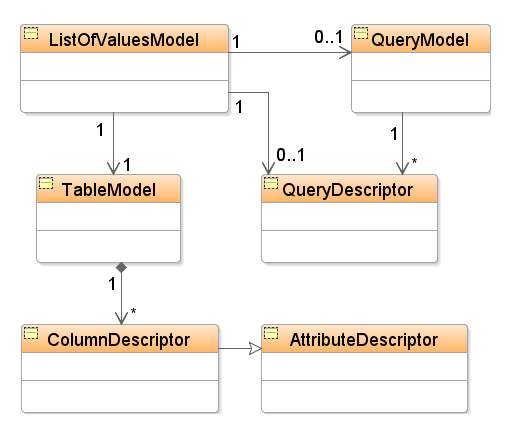 The following diagram( Also see similar discussion in Oracle® Fusion Middleware Web User Interface Developer's Guide ) illustrates ListOfValuesModelthe model class used by the LOV component. 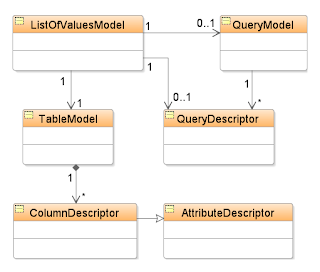 In this diagram, you can also see it's association with the QueryModel and TableModel classes, which are used by the LOV UI component. Awesome post. Hard thing to do without an example thanks for this. THANKS FOR VALUABLE INFO, BUT I JUST WANT TO KNOW MORE ABOUT SUCH SCENARIO WHERE WE NEED TO IMPLEMENT LOV PRO-GRAMMATICALLY ? Thanks for the post. However, any ideas why the table data in the popup won't sort when the sort icons are clicked? Can't see why this won't work, but it does in the ADF Demo code.